When will we stop doing the same thing every four years and marveling that the results are not different? These words were written 40 years ago or more. I remember I wrote a small piece for The Rag about that time to the effect that we were not going to win anything by electoral politics. Yet, every four years -- even today -- we forget this historical truth and embrace the lesser of two evils as though a new age is dawning, never so passionately as we did in 2008. Remember Hope and Change? What changed -- or should I ask, what changed for the better? I was as guilty as anyone. My brain told me not to buy into it, my heart took a leap of faith. There was a long fall from that leap as we watched Obama continue Bush’s foreign policy and violate almost every promise the golden tongued orator made, from Gitmo to electronic surveillance in our own country. Whistle blowers are being prosecuted far more than under Bush, transparency in government undermined at every turn, power usurped by the Republican president is eagerly exercised by the Democrats. A wholesale increase in immigrant summary deportation has occurred. The Democrats and Obama have ignored or capitulated to plunder the environment. The argument is that we should vote for Obama in spite of his betrayals, none worse than giving up on even the public option for health care, because he is better than Romney, even though from the standpoint of progressives he is at best the lesser of two evils. This is the ploy that has kept us chained to the pale and lame horse of the Democrats in every race since 1964. Why must we choose from evils? Why can’t we have a real choice? Sallow-faced liberals sigh and say this is the reality, we must face reality. Bosh. Here is the reality: the system is broken; it is rigged to permit only the two wings of essentially the same party to constitute the choice. I grant the Republicans are bad. That is why we are always backed into the same corner; it is self-perpetuating. When, in what Presidential election, will it be any different? There will always be the argument that we must prevent the really bad guys from getting into office by voting for another candidate who does not represent our views. At this juncture we are ill-served by the supposedly two-party system. And yes, public funding and shortening the length of campaigns are also essential or all our elections, after Citizens United, will be up for the highest bidder, always big corporations and the 1%. The only solution to this perennial waltz of the lemmings is to have a choice on the ballot. More and more people (see Bill Moyers’ show -- "Challenging Power, Changing Politics" -- on PBS of September 7) are recognizing that we need a divorce from the ineffectual, compromising-without-a fight Democrats. We need other parties on the ballot in all 50 states. There is an array of laws in the states (election law is primarily state law) on ballot access. Not surprisingly, Texas has one of the most draconian laws designed to insure that no third parties will get on the ballot. It will not change until we demand a change and stop blindly supporting any yellow dog Democrat. This is the position of not thinking, simply knee-jerking into the same way of doing things election after election. I am through (again) voting for Democrats -- at least in the presidential election -- and being shocked by their retreat and abandonment of progressive principles once elected. This year I worked briefly to get Rocky Anderson, a true progressive, and his Justice Party on the ballot in Texas. It was too onerous a hurdle with time shortened by redistricting cases. Also, the two parties have all the resources. In other words, there was insufficient money and time to wage a court battle to get Rocky on the ballot. That is what it would have taken, what it has taken in the past in the few instances when a third party succeeded. I have litigated such cases in the past with mixed results. The first few times out the Justice Party or the Green Party are not going to win and that is not the point. We need to build toward a future when there is a true choice. Strong third party or parties with left politics could also have an effect on the Democrats who would need to appeal to poor (truly the forgotten population) and working class voters, as well as educated liberals in academia and the professions. I like the two women who are on the Green Party ticket for president and vice-president, Dr. Jill Stein and Cheri Honkala. If I see them on my ballot I will vote for them. I have no idea whether they will be on the ballot in Texas. I hope so but I doubt it. Barring that, I will write in Rocky Anderson. When foreign countries decree that certain parties or certain candidates may not run for office we say it perverts democracy. Yet that is exactly what is happening here in setting up huge roadblocks to any party that represents liberal or radical views. 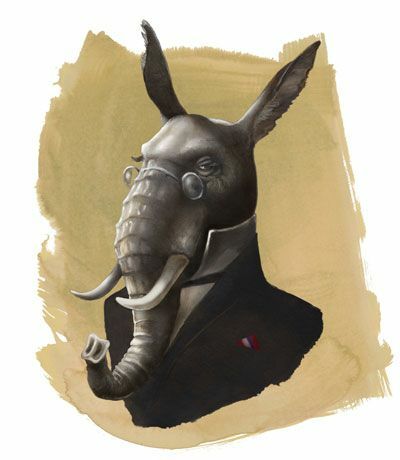 The faithful, if complacent, remnants of the Democratic Party who still read the Texas Observer and speak in their middle-class dens of the need to change things yet steadfastly go to the polls to vote against the greater evil, are not going to bring about any change unless it is ever moving Democrats rightward. They don’t seem to realize that they could vote against a McCain or Romney while not rubber-stamping an Obama. The drilled in mind-set is that in order to vote against the bastards, we must vote for the so-in-sos. We must start now, in this election and beyond, to build progressive alternatives and get them on the ballot. And to change ballot access laws. Only a truly independent party based on principle, not one bought off by Wall Street, can create change or even fight for it. Back in those misty days of the Movement we accepted the mantle of radical because what is wrong in this country will require more -- as we have dramatically seen in the last four years -- than getting another lesser of two evils elected. Organizing on the basis of issues at the grassroots level is still what will bring real and lasting change. However, I now believe we don’t have to abandon electoral politics to the likes of the Koch brothers. But the prerequisite for having democratic government is changing the stranglehold the Repubcrats and Democans have on the system which nominates and elects the legislative and executive lawmakers. That could make a big difference. When will we stop doing the same thing every four years and marveling that the results are not different? Isn’t that the definition of insanity? I am sick of yellow dogs and blue dogs -- of government going to the dogs.